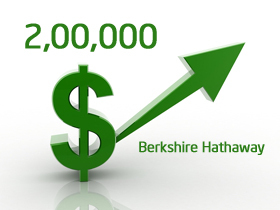 Berkshire Hathaway Stock hits $2,00,000 on Thursday 14th Aug,2014. For those who don’t know about this company Berkshire Hathaway is brain child of Warren Buffet. It is basically insurance & investment firm. Berkshire Hathaway’s success story is known to world. With rise in this stock price it is now one of the largest in world in terms of market capitalization. Current valuation of Berkshire Hathaway is more than 333$ billion. Berkshire stock trades on the New York Stock Exchange in two classes, A shares and B shares. The A class shares are trading on very high value close to $2,00,000. Berkshire Hathaway is true wealth creator for investors. In 1965 Berkshire’s per-stock book value was $19 and today in 2014 it is $2,00,000. If you have invested just $10,000 in Berkshire shares in 1965 today you would have over $100 million. In last 50 years stock value of berkshire hathaway jump by magical 10,000 times. 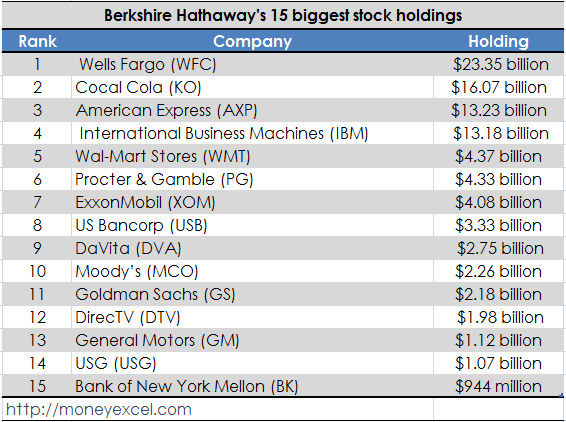 Berkshire Hathaway is holding stock of many company but its three biggest holdings are Coca cola, Wells Fargo and American express. Company is holding stakes in these companies since 1989. Together this three holding adds $52.65 billion to Berkshire balance sheet. More over these companies distributes profit in terms of dividend which again used to purchase more such stocks. Warren buffet is business magnet, successful investor, philanthropist, world third richest person, investment guru, wealth creator, oracle of omaha, good human being and many more. Warren Buffet is the chairman and CEO of Berkshire Hathaway. He is largest shareholder of Berkshire Hathaway. He is ranked as wealthiest man of world consistently. What to learn from Berkshire Hathaway Stock price? Wealth creation will take place if you identify great company and accumulate position in them for long-term rather than trading in and out from stocks. Invest in good company and allow your investment to grow I am sure you will enjoy good fruits in future. Stock market can make you wealthy like warren buffet or rakesh jhunjhunwala. You just need time, money and patience. Stock market investment is most powerful investment and it is best for retirement you can imagine few stocks for Berkshire Hathaway or Infosys is enough for your retirement. What do you think about warren buffet and berkshire hathaway do share your views.